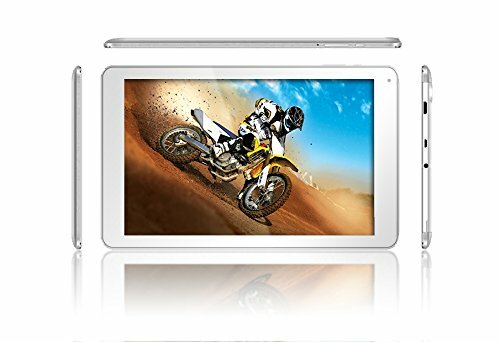 10.1'' Fusion5 104A GPS Android Tablet PC - 2GB RAM - 32GB Storage - Android 5.1 Lollipop - Bluetooth 4.0 - FM - 1280800 IPS Screen - 6000mAh - 2MP front and rear camera - Metallic finish by Fusion5 at Pacs BG. MPN: 104. Hurry! Limited time offer. Offer valid only while supplies last. Fusion5®- GREAT VALUE, GREAT DESIGN . GREAT EXPERIENCE. Best Android Tablets. Fusion5 is a leading independent brand selling tablet PCs since 2010. FANTASTIC VIEWING EXPERIENCE - A tablet with Android 10.1'' screen display and a 64-bit Quadcore processor with 3D graphics (OpenGL|ES 3.1). Free Android apps for tablets + Free Android tablet games. POWERFUL PROCESSOR - MediaTek MT8163 is a powerful 64-bit Quad-core System-on-chip (SoC) processor which incorporates Quad-core ARM® Cortex-A53 MPCoreTM, 3D graphics (OpenGL|ES 3.1), and high-definition 1080p video decoder. The tablet is built to be a high-performance media tablet with PC-like browser, 3D gaming and cinema class home entertainment experiences. AMPLE POWER AND STORAGE SPACE - the Fusion5 104A Android 5.1 Lollipop Tablet is loaded with 2GB of RAM and 32GB of Internal Storage (no partitions). Tablet pc is perfect for multitude of uses. From an office workhorse to a games machine and a movie player! Further storage can also be added via a micro SD card (Supports upto a 128-gb TF-card) (not included). AMAZING VIEWER EXPERIENCE - this Fusion5 104A Android 5.1 Lollipop tablet comes with a 10.1 inch IPS screen and a 1280*800 screen resolution allowing for an amazing viewer experience whether you are watching movies, web surfing, playing games or mulling over spreadsheets. With 6000mah on board battery, you will have hours of guaranteed fun.